Do you have a broken water line or leaking water main? Dealing with a broken water main is not an everyday occurrence. At most, a homeowner will deal with a water line break once in a lifetime. Most homeowners enter a state of stress, confusion and tend to panic as soon as they become aware of a broken pipe. There are many different reasons why your water pipe may be leaking, as well as several steps to follow when repairing your pipe. The most common sign in becoming aware of a water leak is observing a stream of water. The stream of water may become apparent through the foundation wall, showing up on your property or in the roadway. If you do observe a water leak, it does not necessarily mean it is your pipe that is leaking. Water always seeks its way towards the weakest point in the ground or through a wall. It is also possible that the leak is from a neighboring house. You should always call a licensed plumber to confirm the source of the leak. Another common sign is a rumbling or hissing noise coming from the water main at the point of where the pipe enters the house. The only time you should hear a noise on your water main is when water is being used in the house. 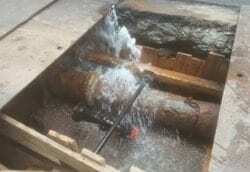 It is likely that you have a broken water main if your water is not being used and you hear a noise on the water pipe. The hissing noise is a strong indication that water is exiting the pipe at some point in-between the house, and the city water main in the roadway. The third most common sign is if you have experienced a loss of water pressure. Not every water main leak may lead to a loss of water pressure however; this is a possibility and should always be investigated by a licensed plumber. The most common factor leading to a water main break is natural wear and tear. The average life span of a water main is 60 years, some may last a lot longer and some may leak earlier. Another common reason for a water main to leak before reaching the 60 year point is shoddy plumbing. The prior contractor may not have installed the pipe properly, or may not have used the adequate fittings when connecting to the city main or the piping inside your home. A couple of less common possibilities are if your pipe has experienced electrolysis or has been disturbed by another utility company working near your home. Electrolysis occurs when a direct current electrical leak takes places underground. It is prone to attacking copper pipes and may result in an unusual smell and green tined staining on the pipe. Plastic tubing can be used to prevent electrolysis. Electrolysis is most common in houses located near a train trestle. Is making a repair on the pipe a possibility, or do you have to replace the entire pipe? The three most important factors to consider when resolving a water line leak are the material, age of the pipe and whether the pipe has had a previous repair. Along with these three factors, the overall cost and reputation of the contractor are heavily factored into the final decision. It is strongly suggested not to repair a water main just to save a few dollars. It is common for a water line repair to leak again in the future, which leads to spending more money to stop the leak. Repairing your pipe at two separate times may end up costing you more money than if you replaced the entire pipe at one time from the beginning. It is suggested to eliminate the risk when repairing the pipe, and replace the entire water main form inside your home to the roadway where the city pipe is located. 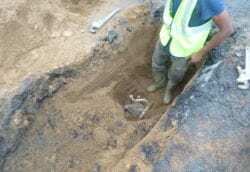 Note- Repairing the pipe is not an option if the pipe is made of lead. Repairing a lead pipe in NYC is illegal as per the NYC plumbing code. As well as the fact that it is an extremely large risk to repair what is most likely a brittle and corroded pipe. You should always check to see if a company is accredited by the Better Business Bureau. All BBB businesses have a detailed background check before being approved and is reviewed on an annual basis. Reviews on the web are a good way to obtain feedback from your surrounding neighbors and other people who have experienced a similar issue. 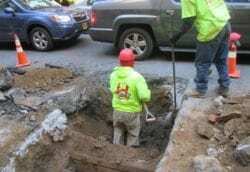 The most important factor to consider is whether the contractor is licensed, bonded and insured as required by NYC to perform sub surface water main and sewer work. You can review any contractor’s license on the DOB website. Do you have a broken water line or leaking water main?